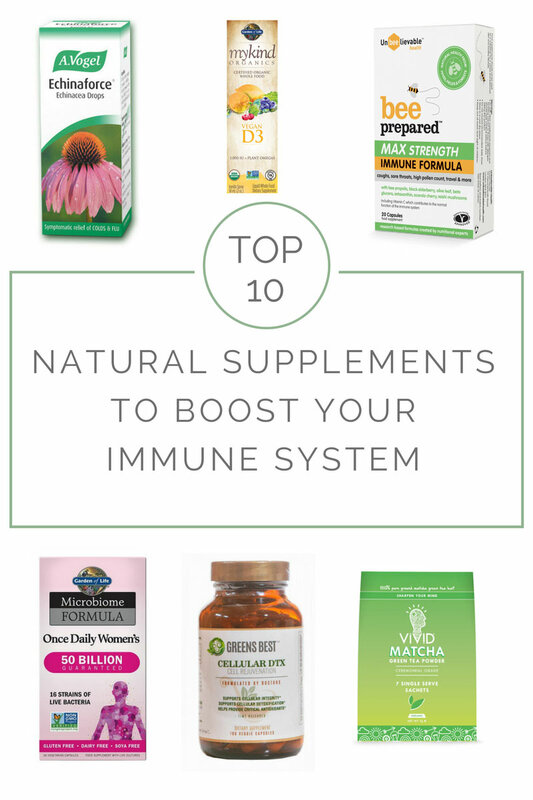 If you are looking for the best natural supplements to boost your immune system, look no further. I have spent hours researching and shortlisting the best immune boosting supplements on the market today and I have picked only the ones which meet my strict criteria: No synthetic ingredients and as natural as possible, with proven immune-boosting properties. If you want to avoid colds and flu in colder months, a vitamin D supplement should be high up on your list. Vitamin D keeps your immune system strong and if you are deficient you are more susceptible to infection and getting ill. Last year, Public Health England issued new recommendations regarding vitamin D: we should all supplement in colder months, starting in autumn, but some people should supplement throughout the year especially elderly people who rarely leave the house. 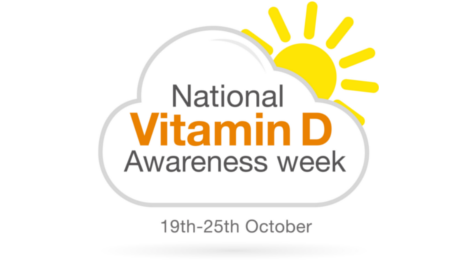 There are so many different vitamin D supplements on the market today which makes it difficult to decide which one to buy. My recommendation is to go for a vitamin D spray as it’s more quickly and efficiently absorbed into the bloodstream and utilised by the body. Tablets and capsules don’t work in the same way. Searching for vitamin D sprays online will tell you that there are a few different brands selling them. But I think I found the best vitamin D spray on the market: mykind Organics Vegan D3 Organic Spray from Garden of Life. Garden of Life’s Vegan D3 Organic Spray is the only vitamin D3 registered with both the Vegan Society and Vegetarian Society (as well as being gluten free and kosher). It is also the only certified organic vitamin D spray on the market. 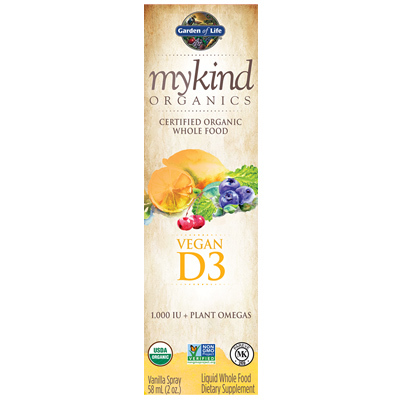 The vitamin D3 in mykind Organics Vegan D3 spray is extracted from lichen and comes in the most natural form, there are no synthetic vitamins in this spray, only pure natural ingredients. Vitamin D is a fat-soluble vitamin and that’s the reason why mykind Organics spray has a lipid base containing organic pumpkin seed oil and organic cranberry seed oil – this enhances vitamin D absorption. The spray is flavoured with vanilla and has added natural sweeteners which makes it taste really delicious. Mykind Organics Vegan D3 Organic Spray from Garden of Life is available from Wholefoods, Planet Organic, John Bell, Revital and independent stores nationwide. You can also find it on Amazon. Did you know that 70% of the immune system is found in the gut? Yes! That’s why it’s so important to keep your gut healthy and care about your gut bacteria (the Microbiome). Friendly gut bacteria help us to digest our food, develop our immune system and protect us from bad bacteria. Digestive issues are very common in the UK but they could be a thing of the past if you supplement with probiotics. Benefits of probiotics are well known so no wonder the market is flooded with different probiotics supplements but they are not all the same – some contain artificial ingredients, unnecessary fillers and synthetic ingredients and some don’t even work as their formula is not strong enough or they use the wrong kind of bacteria. Dr. Formulated Probiotics from Garden of Life were developed in collaboration with Dr. David Perlmutter who is an expert in the human microbiome. Garden of Life’s range of fully natural, whole food, probiotics are individually designed for men, women and children. Garden of Life only uses clinically studied live bacteria that come with full strain identity and are supported by published, peer-reviewed scientific research. These carefully selected friendly bacteria are hardy strains, which means that they are resistant to stomach acid and to bile acid, so they are not killed off, and are able to survive on their journey through the gut to arrive alive in the intestines where they exert their many health benefits. 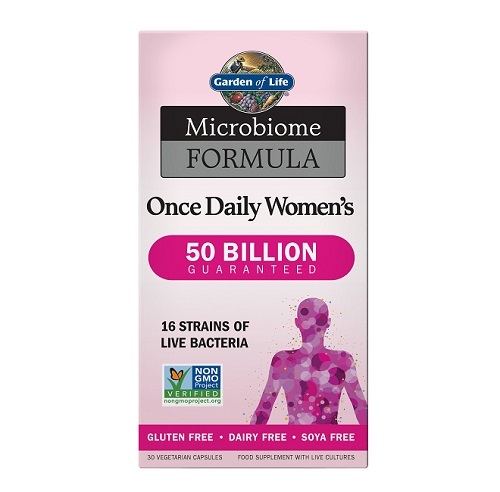 Microbiome Once Daily Women’s Formula (which I’ve tried) is designed specifically to support a healthy microbiome and women’s specific health needs. Since I’ve been taking it I’ve noticed an improvement in my digestion and bloating. Microbiome Formulas from Garden of Life are available from Evolution Organics, Planet Organic, John Bell, Revital and independent stores nationwide. You can also find them on Amazon. Garlic has been used as medicine for thousands of years and today garlic is used to help prevent heart disease, high cholesterol, high blood pressure, and to boost the immune system. A study of 146 volunteers showed that the volunteers who were taking allicin-containing garlic supplement were less likely to get a cold and recovered faster if infected during a 12-week period. Garlic supplements are easy to find and buy but don’t just settle for any garlic supplement, go for the best, organic if you can. 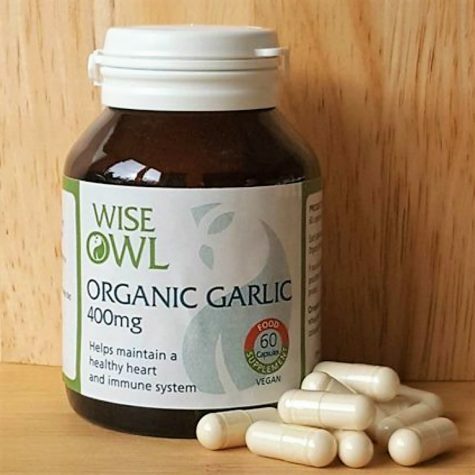 One of the best garlic supplements, in my opinion, are Wise Owl’s whole garlic capsules which are certified organic by the Soil Association and contain no synthetic ingredients, fillers or additives. Each capsule comprises of 400mg of organic garlic powder that is free from live yeast. This garlic supplement is suitable for ages 12+ and also for vegetarians. You can buy Wise Owl’s Organic Garlic capsules here. Today, green tea is ever so popular and for a good reason. It’s full of antioxidants and it has been linked to the prevention of many types of cancer. Green tea consumption has also been associated with increased bone mineral density, and it has been identified as an independent factor protecting against the risk of hip fractures. Green tea is also known to strengthen the immune system because it protects it against oxidants and radicals. In recent years, a type of green tea, matcha green tea has become extremely popular and that’s because it’s better than the normal green tea – when drinking it you consume the whole leaf (in a powdered form), meaning you consume more nutrients, antioxidants and polyphenols. Polyphenols boost your natural immunity and also help the body to fight infections and even autoimmune diseases. Matcha green tea powder is not technically a supplement but it does come in a capsule form for those who don’t like drinking it. I drink green tea every day but it’s only recently that I’ve tried matcha green tea –Vivid Matcha. Vivid Matcha is “ceremonial grade” meaning that unlike some competitors it is the highest-grade tea available and the highest quality. It is also certified organic which is really important as you don’t want to be consuming all those pesticides when drinking your matcha. It took me some time to get used to drinking matcha but I got the hang of it at the end. To make a lovely matcha drink you should put the powder through a sieve first (to prevent any clumps). You then add some hot water (but not too hot as this will make it bitter) and whisk it until it starts to foam. Add more water and enjoy either sweetened with a bit of honey or without. The nutrient-packed powder comes in handy sachets (or pouches) which makes it easier to grab a natural pick-me-up any time of day. Vivid Matcha is available from Tesco and Waitrose. Bee pollen is one of nature’s ancient superfoods which contains almost all the nutrients humans need for life. Bee pollen has long been valued for a host of nutritional and therapeutic benefits and is packed full of proteins, minerals, vitamins and amino acids. It is well documented for its ability to boost overall health including immunity, digestive system, skin, asthma, allergies, hormonal imbalances and more. Bee pollen comes in different forms, granules being the most natural, however, granules are hard and can be difficult for the human body to digest fully. The other form of bee pollen which you will find is a powder (milled pollen granules) but you need to know that heat generated by normal milling processes can degrade or destroy some of the bee pollen’s delicate nutrients. There is another process which makes bee pollen more digestible but it doesn’t destroy the nutrients – it’s called ‘freeze-cracking’. Freeze-cracking is a special process where the granules are carefully cracked open and milled to a powder at very low temperatures in order to preserve all the nutrients inside the bee pollen granule. This is the reason why Apibal Freeze-Cracked Bee Pollen is special and better than some other bee pollen powders on the market. It comes in capsules so it’s easy to consume without actually tasting it. I’ve been using Apibal Freeze-Cracked Bee Pollen for weeks now and what I did notice was an improvement in my skin – definitely been having fewer breakouts. Apibal Bee Pollen is available online at www.apibal.com and independent retailers across the UK. Cellular DTX is an immune boosting supplement which works on a cellular level. It’s been formulated by doctors who combined modern science and ancient wisdom to provide one of the most effective and natural health supplements around. The focus of Cellular DTX is on cellular health which hasn’t been in the spotlight enough but it’s very important for optimal health. Our bodies are composed of trillions of cells and if these cells don’t get the nutrients and vitamins they need, they will not work efficiently. Poor cellular health has been linked to conditions such as diabetes, cardiovascular disease and cancer, as well as heart failure and high blood pressure. In order to lead healthy lives, it’s imperative to make sure our cellular health is tip-top. Cellular DTX is packed with anti-inflammatory ingredients such as turmeric root and green tea, as well as astralagus, a herb used in traditional Chinese medicine famed for its immune-boosting properties. By supplementing with Cellular DTX, you can improve your cellular health and this will result in a better immune system and general health. One of the key ingredients in Cellular DTX is turmeric which has proven immune-boosting properties. Another health-promoting ingredient in Cellular DTX is green tea which contains cell-protecting polyphenols (catechins) which are famed for their medicinal and antioxidant properties. Finally, Astragalus herb, also found in Cellular DTX, was used in traditional Chinese medicine for its immune-boosting properties and ability to combat stress in the body. Astragalus is brimming with positive compounds including flavonoids, saponins and polysaccharides, which together have antimicrobial and anti-inflammatory capabilities. Flavonoids also play a role in the process of cell signalling. Cellular DTX also contains piperine, an alkaloid in black pepper, which contributes to better absorption of turmeric. You can buy Cellular DTX exclusively from Water for Health. Spirulina is a blue-green algae which has a long history of use as a food. It was used, cultivated, sold and eaten by Aztecs in the 16th century and it’s also been used in Africa for a long time – in fact, it’s still used by the people of Chad today who live near Lake Chad where spirulina grows naturally. Spirulina is a nutritious superfood which is extremely high in protein (65%) so it’s perfect for vegans and vegetarians. It contains all 9 essential amino acids, building blocks of the body (all of which the body can only obtain through food). Spirulina also contains various minerals such as iron, calcium, magnesium and zinc. Zinc is a vital protector of the immune system and essential mineral for the structure and function of all cell membranes. Spirulina has been proven to have a positive effect on the immune system by promoting the activity of natural killer cells. It has antiviral and antibacterial properties and it has been proven to inhibit influenza virus and reduce virus-induced mortality. When buying spirulina supplements you need to pay attention to the source of spirulina and its purity. The best quality spirulina is grown in a clean and unpolluted environment to avoid contamination with toxic metals such as mercury and lead. This is the reason why I picked Lean & Green Organic Spirulina from Green Goddess to feature in this article. Organic spirulina from Green Goddess is cultivated away from agricultural or urban pollution and is hand cleaned. It is routinely tested to ensure the tablets are as pure as possible. It is tested for mercury, lead and other contaminants and daily samples are taken from the water measuring PH and optical density (this tells when to harvest the green stuff). If you ever tasted pure spirulina powder you will know that the taste is revolting and that’s why I love spirulina tablets so much – when you swallow them you don’t taste anything. It’s the best way to consume spirulina! You do have to have quite a few of the tablets to reap the benefits though (up to 10 a day). What is also great about Lean & Green Organic Spirulina tablets is that they don’t contain any other ingredients, compressed spirulina powder and that’s it. You can buy Lean & Green Organic Spirulina tablets directly on Green Goddess’s website. The Bee Prepared formulas have been researched and formulated by nutritionists and combine high quality, plant-based nutrients with proven benefits for the immune system, which are not usually found in a regular diet or multivitamin. I’ve been taking Bee Prepared capsules for years (previously reviewed here) and they are something I like to add to my health regime when I am stressed, sleep deprived or when I feel like I am getting a cold. This amazing supplement is something that works for me every time. I haven’t had a fully developed cold in years and I can thank Bee Prepared for that. To make sure it works for you, take it when you feel your immune system is not at its best and you feel a bit run down. There are two versions of Bee Prepared – Daily Defence and Max Strength. Bee Prepared Daily Defence is ideal for year-round immune support and contains the following active ingredients: propolis, black elderberry, olive leaf, beta glucans and acerola. Bee Prepared Max Strength is a more concentrated version with the addition of astaxanthin and reishi and is for those who don’t always take supplements daily or may need a bigger boost- for instance, when one feels an illness coming on, before or during travel or during periods of high pollen count. Both Bee Prepared versions can be taken alongside other supplements such as probiotics and vitamin D.
What I really like about Bee Prepared supplements is that they are also Vegetarian Society approved and manufactured in the UK with EU sourced ingredients. You won’t find any synthetic or GM ingredients in these supplements which is another plus. You can find Bee Prepared supplements in Holland & Barrett, on Amazon, Planet Organic and other independent health stores and retailers. Omega-3 fatty acids are well-known for their anti-inflammatory effect but they also play a role in boosting the immune system as some studies have shown (this study and this study). Omega-3 fatty acids also play a crucial role in brain function and are important for a healthy heart. Not to mention they can improve bone strength and joint health. The best source of omega-3s is fish so if you don’t like fish or don’t eat it very often it’s very important to supplement, especially if you are elderly or get ill often. Fish oils are a very popular way of supplementing with omega-3s but unfortunately, the quality and purity of fish oils you buy online is questionable. I have previously spent hours researching and reading about fish oils, cod liver oil in particular, and have discovered that the process of extracting and bottling fish oil is crucial in determining the final oil quality. Fish oils are normally heated during the process which removes valuable nutrients and you don’t want that. If you want the best fish oil supplement, go for raw fish oil which has been produced without the heat. Rosita Extra Virgin Cod Liver oil is one of such oils you can find on the market today. You can buy it on Amazon. Echinacea, a native of North America, is widely used to prevent, or provide early treatment for colds. Several laboratory and animal studies suggest that echinacea contains active substances that boost immune function, relieve pain, reduce inflammation, and have hormonal, antiviral, and antioxidant effects. A review of 14 clinical trials found that echinacea reduced the odds of developing a cold by 58% and the duration of a cold by 1 to 4 days. So if you or your family members suffer from regular colds, this is something no doubt worth having at home. Echinacea Drops from A. Vogel are available from a variety of shops and online, including Amazon and Holland & Barrett. So there you have it, some of the best natural supplements on the market today which can help boost your immune system. If you decide to take any of the supplements mentioned in this post you need to familiarise yourself first with how to use them correctly. Some supplements are not designed to be taken long-term. You also need to follow the correct dosage and not to go over the recommended intake. If you are pregnant or breastfeeding it’s not recommended to consume bee pollen and some other supplements. You need to consult your doctor first. Also, if you are on blood thinning medication you should avoid supplements such as bee pollen and garlic. If you have allergies to bee products such as honey you should not consume bee pollen. Combining Spirulina with herbal supplements that slow blood clotting may increase a person’s risk of bleeding. Such herbs include cloves, danshen, garlic, ginger, ginkgo, ginseng and turmeric, according to the NIH. Whatever medication you are taking, please consult your doctor first before taking any natural supplements. Be Healthy Now blog takes no responsibility for the wrong use of supplements, these are taken at your own risk. We are not qualified to give nutrition advice. Omega-3s – Rosita Extra Virgin Cod Liver Oil is one thing that I think can surely help in boosting immune system.